Last week I had just crossed the border that separates Laos from Thailand and was on route via land to Thailand. My mind was on Laos – a country branded globally as ‘Simply Beautiful’ (backed by the ADB in 2018) to attract visitors into the country. But the initial media reports stated that that the attempt had not produced the desired results. Research has revealed that marketing and promotions done on ‘a destination’ will only impact the brand in two to three years. Hence the marketing promotions done in 2018 for Laos will only come to play 2020 and beyond. Maybe it’s a good learning for Sri Lanka. The logic holds ground as the profile of a traveller targeted works via the travel trade in the key markets of Europe with wholesalers such as Thomas Cook. For this to be done it requires time to contract and brochures to push the brand in those markets. If the profile of the customers was younger and affluent, then the market development time lag can be as short as six months given the mix between online travellers and the wholesale market, the best case in point being Maldives tourism. Another issue raised by the private sector of Laos tourism was the ‘product not being developed’. The term they used was ‘activities’ supported by the infrastructure development to support the strong marketing. An interesting lesson for the tourism industry globally, given that whenever a conflict is ended a country goes on a tourism brand push expecting the industry to kick into the economy, but sadly this has been proven wrong many times – the recent being Laos’ global campaign ‘Simply Beautiful’. If I look at Sri Lanka Tourism, whilst many can be critical, the fact of the matter is that we have almost 90,000 hotel rooms (including the informal sector) whilst the road network is strong. The product range is diverse – wildlife, beaches, 2,500-year-old historical ruins in Polonnaruwa, eighth Wonder of the World – Sigiriya, best in Ayurveda, warm Sri Lankan family culture and of course Ceylon Tea, Ceylon Sapphires and Ceylon Cinnamon. All this in the close proximity of three to four hours of travelling time, which makes Sri Lanka unique in the eyes of a global traveller. On a separate note, the overall structure of the tourism industry is mature with provincial, district and even village level committees and chambers, which gives stature to the industry. Apart from this, the country has a powerful hotel association (THASL), a vibrant travel trade (SLAITO) and a strongly linked SME association (ASMET). Separately, Sri Lanka tourism is part of a global travel trade industry of online travel agencies like Booking.com, etc., influential marketers – global tourism ambassadors, PR agencies, ad agencies, travel bloggers and international organisations like WTO and PATA not forgetting the academia like the University of Colombo Tourism Faculty. In simple words the Sri Lanka Tourism industry ‘Eco system’ is mature and well-structured, but it must become competitive. 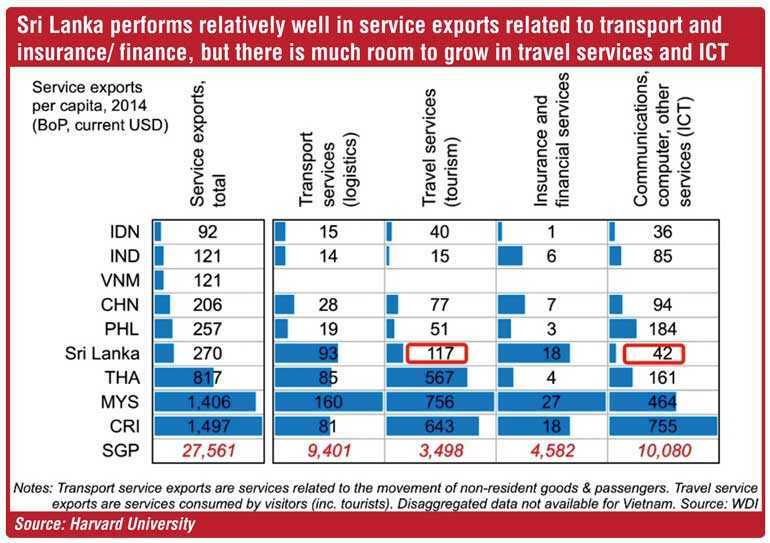 The logic being that Center for International Development by the Harvard University has done an analysis where Sri Lanka’s competitive rank on travel services is at 117 which needs to be focused and corrected (see chart). If we analyse the KPI (Key Performance Indicators) strictly by the data available publicly, the satisfaction scores by the visitors at the airport exist survey is that it is very positive. Almost 95% rate the experience satisfactory and above. At a micro end, each property is being critically evaluated by entities like TripAdvisor reviews, etc., whilst an internal appraisal system on consumer surveys are done regularly and discussed at the board level for course correction. Overall the industry is making reasonable money given the foreign exchange gains having an upside in 2018. But we must note that, the overall costs of construction and based on the wages and taxes are having a negative impact to the ROI calculations. We see similar analysis done on the tea industry, rubber, cinnamon and ceramics or even in the case of education but the most fiercely debated in the business world is tourism, given the challenges the companies are facing at the ground end. The perennial issue of the Sri Lanka tourism industry has been the communication and positioning of the destination in the competitive global arena. Maldives apparently invests around $15 million on global promotions whilst Thailand and Malaysia cross $35-40 million a year. Countries like Cambodia and Myanmar are investing as much as $ 20 million whilst Sri Lanka invest at best a maximum of at $ 2-3 million – even after taking into account the private sector marketing investment. This is the reality, even though there is almost 5-7 billion in the bank account of the relevant State organisations tasked to shoulder this responsibility. As a business model if I am to conceptualise, awareness and Top Of Mind (TOM) is the key issue that must be addressed by the tourism industry. The logic being that trial/visits has picked up from 0.5 m in 2009 to 2.5 million with a repeat purchase (intention to revisit a destination) as high as 85% which is a strong strategy for any industry to have. The argument by the industry is that if we can drive up awareness and position the country sharper, then Sri Lanka can attract a better visitor profile from the current spend of per day of $ 170 to say $ 250 which can give a different shape to the industry. If I am to put a number, the awareness level of Sri Lanka as a tourism destination was around 4% in the 2010-’12 time period. There has been no study done of the brand position given that Sri Lanka tourism has not had a partner research company or for that matter did not have a global advertising agency up until end of last year. However, in the recent past the reality has taken a U-turn. 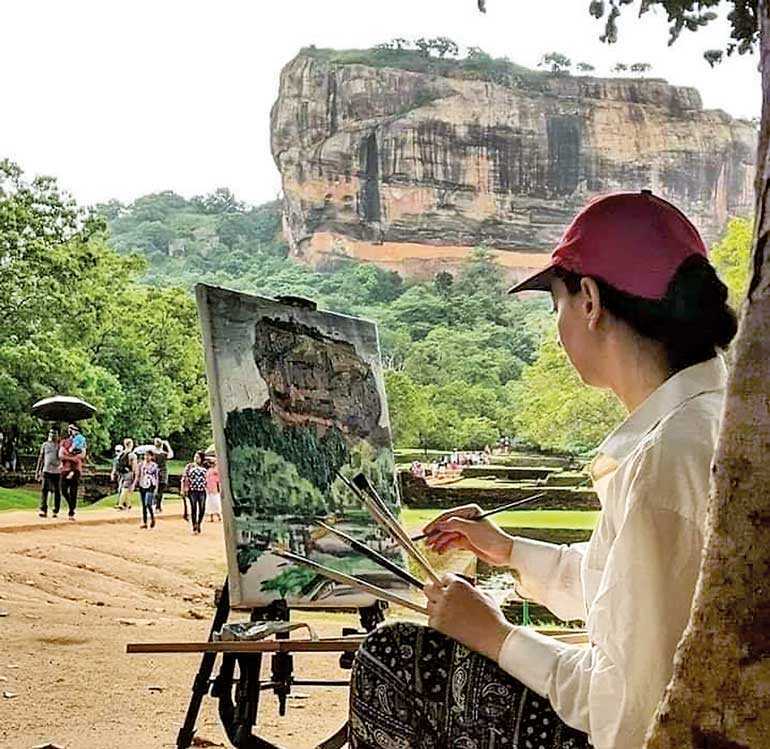 The awareness of Sri Lanka as a tourist destination has catapulted to be a Top Of Mind (TOM) brand with Lonely Planet ranking the country as a Must Visit Destination at first place for 2019. Recently we also and recently had Sri Lanka (Colombo) judged to be a ‘Must Click’ location for photographers. Hence, we see that in the global market place Sri Lanka has suddenly become a key brand on the ‘awareness set’ of a customer and for sure a TOM brand among some. I am sure the unaided recall might be very close to the aided recall rate with the strong endorsements we have received in the recent past. But the million dollar question is, what do we do next? In my view we must now start the journey of ‘positioning’ the country so that we are distinctive in the global marketplace. I am not sure if the tag line ‘So Sri Lanka’ can do justice with this line of argument given that it is not aspiration in nature but more of accepting the current status quo. The positioning will not differentiate the brand in the competitor set is what professionals are commenting. I guess the authorities will have to check this feedback and if needed do the changes. All I know is that Sri Lanka will not get this chance again in the global stage for the next decade and we must take action quickly. To be honest we are already late on the roll out. The agenda must be a single-minded in focus: Convert the ‘awareness’ to trial, targeting a different target group which is bound have a higher purchasing power. This can only be done with a strong public- private partnership given that almost 99% of the industry is private sector owned. The question is, can this be done in an election year?